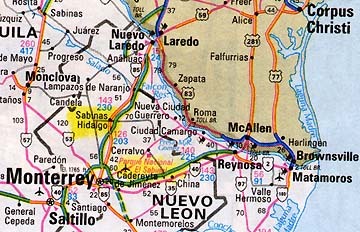 Sombreretillo Dam is west of Brownsville, Texas, in the state of Neuvo Leon, Mexico. June 22, 2006 State of Nuevo Leon, Mexico - On June 4, 2006, around 5 p.m. amid the water lilies growing thick in the reservoir water at the Sombreretillo Dam, Dr. Efren Saucedo Tello took photographs of kayakers going by. Later when he looked at his photographs closely, he was stunned to see what looked like a large and very black "creature" standing in the water as if watching one of the kayaks. Around the very black entity is another odd shape that is beige-colored.